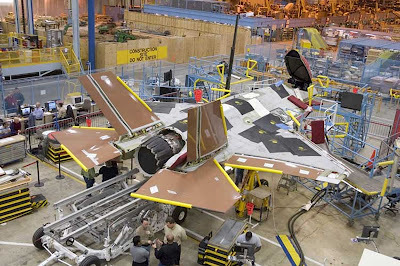 How Does a Fighter Jet Get Made? 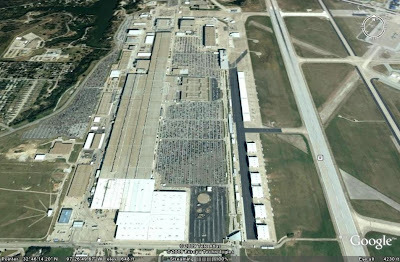 Time for a trip to the Lockheed Martin facility in Fort Worth to find out. You have to know someone to get in the door here. A fellow RVer's son works there and took us on a tour. While the Boeing plant in Everett, WA is presently the world's largest building by volume, this place is pretty darn big! Almost 1 mile long! 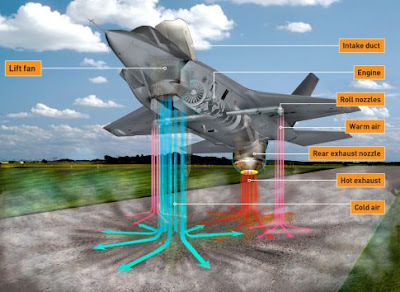 Most of what we saw was the new fighter jet, the F-35. We saw the third one ever being built. This jet has 3 different versions, but this one is the the most amazing to me. Confused? Here's the explanation. It's beyond me. Maybe I should move on to something I know more about. How about the Fort Worth Botanic Garden? This is a 109-acre collection of 2,500 native and exotic species of plants. Check out the pollen! No wonder my nose is running and I'm sneezing. Heading north through Fort Worth was a daunting journey. Lots of traffic and roads. Maybe I'm too far East again? I'm staying in a lot at the Stockyards, a historical district in Fort Worth, with the SI, Singles International, the singles group of FMCA. This is a great opportunity. Lots of the buildings are over 100 years old. Twice a day, they have a "cattle drive" down the main street. It was pretty tame and I was a tad disappointed. They were walking slower than I do. I guess I was expecting "The Running of the Bulls." These cattle must be well into old age. The first night we went to a terrific bar, Pearls. Margheritas were only $1, and they were pretty good. Sher heard that the 20th one was free, so she started collecting cups. "If you're gonna play in Texas, you gotta have a fiddle in the band." Seems to be true in this neck of the woods. This guy was great playing "Cotton Eye Joe." The Texas capitol in Austin is the largest state capitol in the US, but not the tallest. Louisiana has it beat by a lot. I was there back in 1996 and wanted to revisit it. One thing I was impressed by then was the old Treasury Office, with all the old machines in it. It's now the start of the free tour, but amazingly you can wander around on your own without going on the tour. The inside of the dome is beautiful. Those tiny T-E-X-A-S letters at the top are actually 18 inches high. The floor under the dome is a mosaic that depicts the six nations that have governed Texas. The Senate Chamber, where 31 senators meet when they are in session. Even the door hinges are big here. We haven't been too lucky at finding Bluebonnets in bloom, but the Prickly Pear Cactus were out in force in the Austin area. But the "Tourist Trap" section of the building was really interesting. Inside were lots of pictures and memorabilia from famous artists who have played here. Alot of the pictures were taken with James M. White, the now-70-year-old-owner and founder of the Broken Spoke, who was present when we were there. 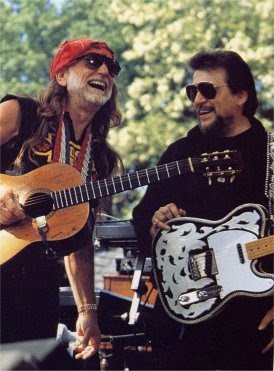 Here's a picture of him with a much younger Willie Nelson. We were certainly kept busy! Most days there was 4 hours of dance instruction. Chuck and Sheri were terrific, and taught us a lot of waltz turns that could also be used in Two-Step. The 170 participants were divided into 5 groups, each of which took turns doing chores, preparing and serving breakfast, and providing entertainment and snacks at the afternoon get-togethers. The Purple Team did a rousing rendition of the "One-Eyed, One-Horned, Flyin' Purple People Eater." My Red Team dressed in rabbit ears and bunny tales and put on an egg toss contest the day before Easter. And then in the evenings, there were dances, either at the park or downtown. Some were theme dances, such as this one, the Roaring Twenties. I got my dress at Goodwill for $10. Some of the sequins were falling off, but it didn't matter. There was lots of feathers, fringe, and fun! Those gals could really dance the Charleston -- I just couldn't believe it. Another evening's theme was "Puttin' On the Glitz." Our entertainment that night and several of the other nights was Ronnie Furr. He's a great singer and entertainer, and we all enjoyed him just as much as we did last year. Lots of sparkles all around. I'm in the back row here. Although the dances and dance lessons at the Dance Rally are terrific, my favorite place in Bandera is the 11th Street Cowboy Bar. Every Wednesday night, they have a "Burn Your Own," along with live music, and no cover charge. The first week we were there, the Lone Star Pickerz were on stage. They're a great band, and played at our Dance Rally the following week. They invited the women of our group up on stage to perform as the "Irritations." Since I'm not a good "wiggler," I chose to be the photographer. This bar is unusual in several ways. Inside the bar are lots of bras hanging from the ceiling. The story is that if you leave your bra here, they'll give you a t-shirt. And outside the door here, as well as all over town, are places for you to tie up your horse. The second week another band, the Rusty Nails, played. Although most of the music was country, here I'm dancing to an Elvis tune. Two fun filled evenings spent with friends. How much better can life get? The Cowboy Capital of the World, Bandera, TX, is once more the site of the annual Singles International Dance Rally. It all started off with a barbeque, "Down by the River." We rode a hay wagon the half mile to the river. The theme this year for the first night was Li'l Abner and Daisy Mae. It's amazing what a blond wig and a couple of socks will do! Even Mammy Yokum was there, enjoying our spot overlooking the river. There are 170 single RVers here, all ready to dance. After dinner, we were entertained by skits put on by 3 local cowboys. Here one kidnaps Pam. She won the part because she screamed the loudest. Another day we had a tacky fashion show. I can't believe these people carry all this stuff around in their rigs. Today, the Today Show showed up in town to film a segment at the local hot dog stand. They said it would air on the weekend, either Saturday or Sunday. While watching the filming, I ran into Walking John, the cowboy I met last year. He even remembered me! Well, not really.... But Luckenbach was made famous in the song by Waylon Jennings. The town was founded in 1849 as a trading post, and was bought by Hondo Crouch in 1970 for $30,000 when he saw an ad in a newspaper the read "Town for Sale - Pop. 3. Needless to say, t-shirts are a large part of the town's economy. There's a bar with some interesting decorations. But there's a lot of history, and a great dance floor inside. Even the chickens like it! Texas law still allows smoking in bars, but they can at least ask nicely that patrons not smoke. We went back in the evening for the entertainment. First we saw a jam session outside. Note the chicken and the rooster watching from the high seats. Later instead of Waylon and Willie, we saw Bo Porter. Excellent band and a good dance floor.